1957 was a turning point for Spoleto when Gian Carlo Menotti, the Italian-American composer started the now world-renowned Spoleto festival. 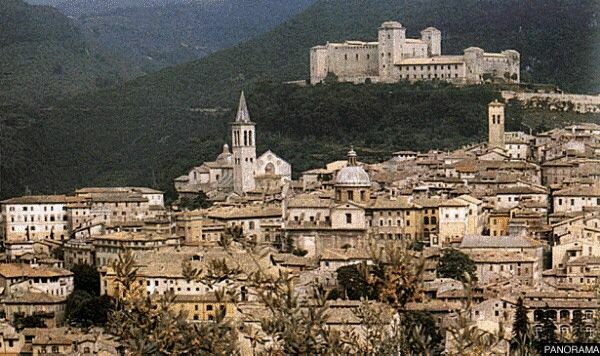 From then on Spoleto became a tourist destination with sights to see all year long such as museums, impressive architecture and beautiful views, Roman remains and plesant streets for leisurely wanderings. The festival is a celebration for drama, music, opera and dance lovers and so the city overflows with tourists and accommodation is hard to be found. 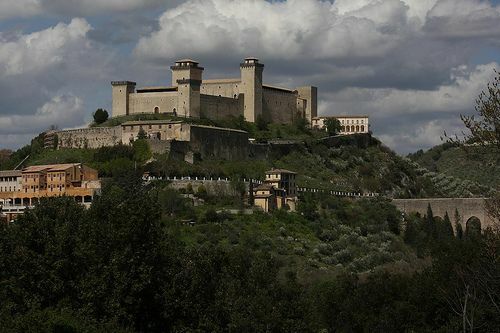 It´s definitely recommended to make a reservation at least 3 months in advance or if not to stay in a neighbouring town and come to Spoleto for the performances. To get to the old part of town, take the orange A,B,C bus which calls at Piazza della Libertà in the centre with Piazza del Mercato just a short walk away and in the very heart of the old quarter. Near Piazza della Libertà is the tourist information office and a Roman theatre. This is where most monuments and nice shops can be found. Con Spoleto on Piazza della libertà is family-run and offers plesant accommodation in an excellent location. In Ancient times Umbria was under the power of the Etruscans and the Umbrians until Rome took power. After Rome ‘s fall the Byzantines took all land to the east of the Tiber and the Lombards controlled the land to its west. 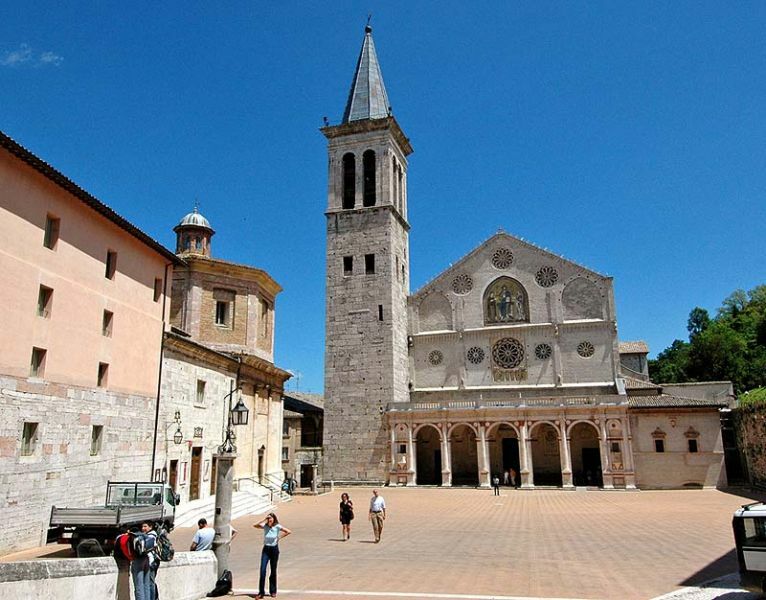 Spoleto become the Lombardy Duchy’s capital and gave the Holy Roman Empire an emperor. In the Umbra Valley, which was once called the Vale di Spoleto, creative draining techniques have been set up in order to make the most of the land for agriculture. Spoleto has mastered the art of truffle dishes like many of the towns in Umbria. Pasta dishes are frequently served with tartufo nero as a tasty addition. Pizzeria Zeppelin offers well priced pizza and snacks. Osteria dell’Enoteca occupies the building which was originally a 12th century tavern. There is a lovely atmosphere with a high stone ceiling and the walls lined with rows of wine bottles from which diners can take their pick.Traditional dishes are served at very reasonable prices. Taverna La Lanterna is situated in downtown Spoleto. It has both Umbrian pasta and vegetarian dishes at affordable prices. Osteria del Trivio is a comfortable and pleasant restaurant with a family-friendly atmosphere. The most recommended dishes are strangozzi alla spoletina ("strangled priests"),a typical dish of an irregularly shaped fettucine pasta in a tomato and pepper sauce, the antipasti and filled artichokes. L’Angolo Antico this off the beaten track restaurant and pizza parlour also has good strangozzi alla spoletina and pork in lemon sauce. Ristorante degli Abeti is a paradise for food lovers with a great menu of pasta and meat. Pasta with wild boar and truffles and ham with wild boar are particularly recommended. Ristorante Apollinaire has outstanding culinary delights. 12th century walls, wooden beams and shimmering candles make a a wonderful setting for vegetarian, truffle, traditional and nouvelle cuisine dishes changing according to season. Desserts are also a must! BY BUS: travelling by bus is not the norm as the trains are so efficient; however they are necessary for travelling to Norcia and Valnerina (duration: 1hour, services: 6 a day), to Monteluco (duration: 15 minutes, services: ever hour in the summer). Buses leave from by the railway station. Buses A, B, C with a sign reading Centro go from the railway station to the centre of town. BY TRAIN: to Rome (duration: 1 ½ hours, services: every hour), to Perugia (duration: 1 hour, services: 9 a day), to Assisi (duration: 40minutes, services: every hour).